I was in the frozen food section, just a few aisled off course in the neighborhood Food Emporium (list: coffee, half & half), when I remembered. More than 48 hours after the Grammy red carpet closed, it’s still coming back to me. 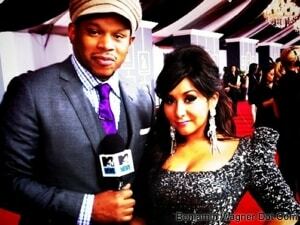 “MTV News’ Grammy Pre-Show” was helmed by Sway Calloway, with an assist from “Jersey Shore” star Nicole Polizzi and Rock Editor James Montgomery. I was on hand to Executive Produce. I’ve worked a dozen VMAs, Oscars and Grammys, but the scale of the production never fails to flabberghast me. The white-tented red carpet runs nearly two city blocks, buffeted by satellite trucks and Star Wagons from E!, ET, Access Hollywood, CNN, and TV Guide. Thousands of crew are employed. The carpet opened at 1pm. Snooki arrived, leapord-print slippers at the ready just prior. I spotted Lou Reed (black boots, t-shirt and sport coat) first, then Metallica’s Dave Mustaine. We were live for over two hours, ten of us and a TriCaster (digital video mixer) on an 8′ x 8′ platform. It was a dizzying, adrenaline-fueled, star-studded afternoon. Kim Kardashian, Miley Cyrus, Paramore, Bruno Mars, BoB, Drake, Nicki Minaj, Jennifer Lopez, Tyrese, Jennifer Hudson, LL Cool J, Marky Ramone, LaRoux, Crystal Bowersox, Kathy Griffin, Swizz Beats and “Glee” star Matthew Morrison all stopped to talk. I don’t remember much beyond a thousand micro-directions, emails, Tweets and one dirty look from “The Insider” hostess Lara Spencer. And a few seconds in the middle of it all when I showed Nicole photos of Maggie. “Does it change your life like they say?” she asked. I do recall walking Snooki back to her hotel. Dusk was settling over the LA Live complex: part sports arena complex, part mall. Nicole was legitimately exhausted from hours on the red carpet. Hundreds of teenagers (and their parents) swarmed us, scurrying ahead, snapping pics and shouting. Nicole averted her gaze as my colleague and I endeavored to decline on her behalf. Her fans were persistent, insistent, if not indignant. Periodically, she’d stop and smile. I settled her into a lobby banquette with her boyfriend, Jionni. One delicious, well-earned shot of Patron later, Nicole and Jionni climbed into their BMW and disappeared into the urbanglow.